Looking for a fun way to encourage your kid to <a href="http://www.inhabitots.com/7-ways-to-raise-a-healthy-adventurous-eater/">eat more veggies</a>? Try a few new, exciting salads - your kids will enjoy helping to prepare them and the whole family will savor them. Salads are a great food to get your child started cooking on his own, too. As long as you do the chopping first (though some salads don't require any! ), no dangerous jobs are needed to prepare a delicious salad. Plus, we bet your kid will love picking and choosing different veggies to toss in - playing with colors, flavors and a variety of dressings. 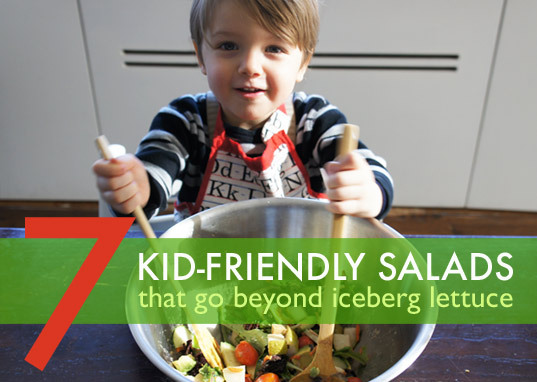 Salad making may even encourage your kids to try veggies they've never eaten before! So read on to discover seven easy-to-make veggie-packed salads that are healthy for the whole family. 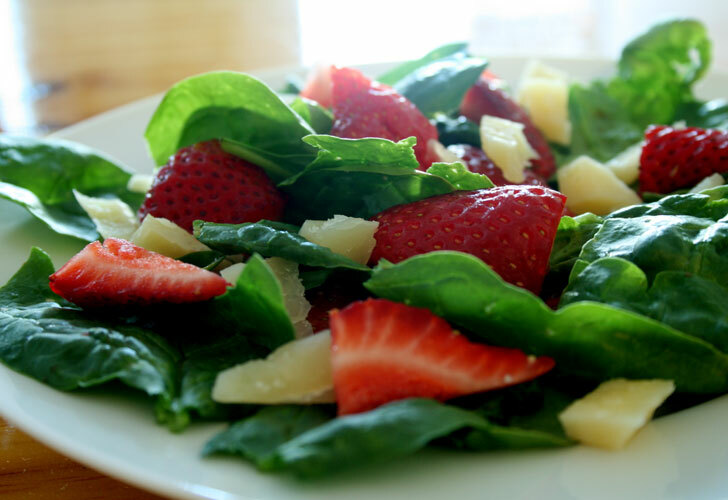 <h2>Strawberry Salad</h2> Strawberries will add a splash of kid-pleasing sweetness and color to any salad. Try mixing slices into a spinach salad. Add other fruit like nectarines or pineapple, or try tossing in chunks of avocado, cucumber for crunch or a bit of cheese. 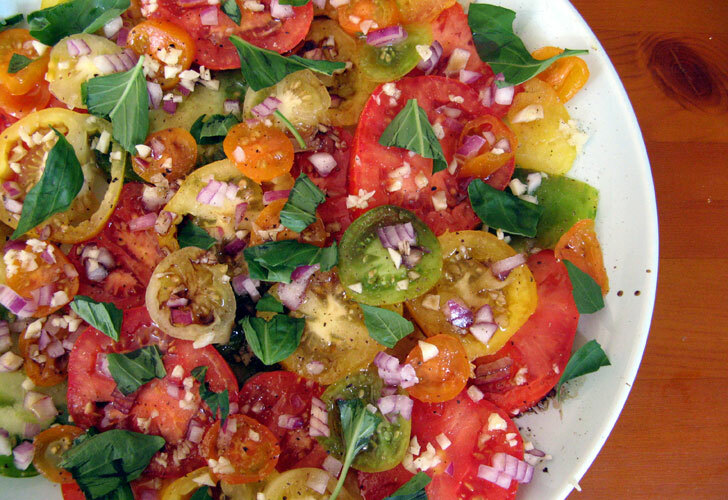 Top with a balsamic or fruit vinaigrette to enhance the flavors. 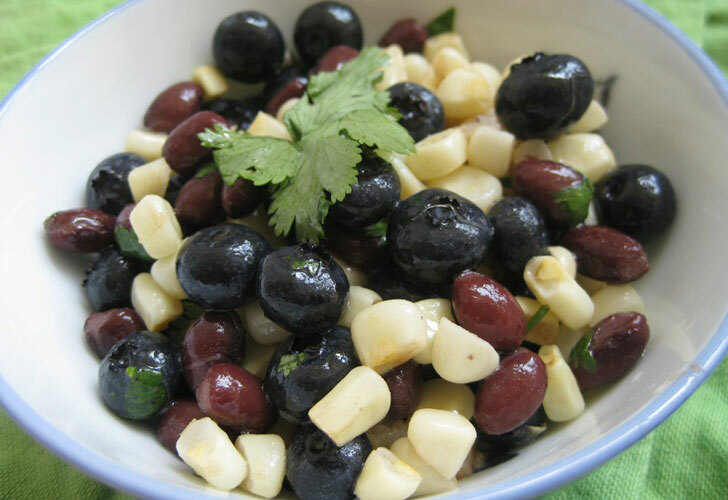 <h2>Black Bean, Corn and Blueberry Salad</h2> You may surprised by the addicting power of this unexpected <a href="http://www.inhabitots.com/seasonal-summer-salad-black-bean-corn-and-blueberry/">fruit-veggie-legume mix</a>. Mix 1 cup blueberries, cooked kernels from 1 to 2 ears of corn and 1 can rinsed black beans. Toss with a vinaigrette made from 1 Tbsp olive oil, t tsp balsamic vinegar, 1/2 tsp salt, juice from 1/2 lime and 2 Tbsp chopped cilantro. You can also add romaine lettuce if desired, but then you may wish to double the vinaigrette recipe. When making this salad in the summer, you can use blueberries and corn from your local farmer's market. Get the full <a href="http://www.inhabitots.com/seasonal-summer-salad-black-bean-corn-and-blueberry/">Black Bean, Corn and Blueberry Salad and vinaigrette recipe here</a>. 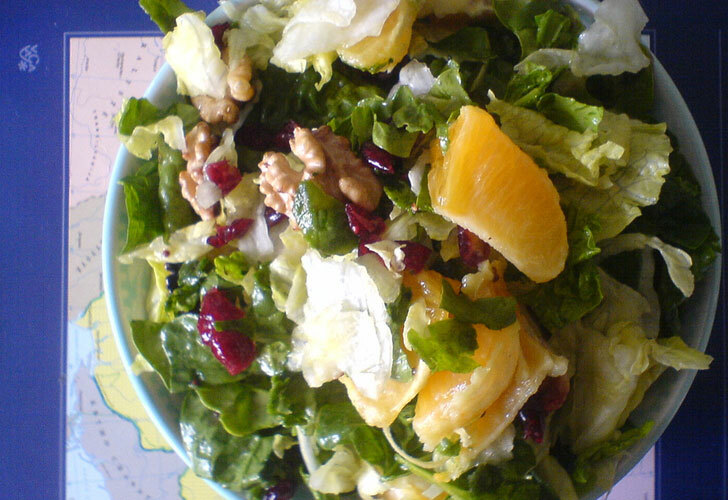 <h2>Cranberry, Walnut, Orange Salad</h2> If your child loves oranges, she'll scarf down this salad in seconds. The juiciness of oranges, sweetness of cranberries and crunch of walnuts all come together to make every bite of this salad far from boring. We also love that this recipe requires no cutting, so it's an easy one for kids to make on their own. Simply peel the oranges apart, throw in a handful of cranberries, break up a few walnuts using your fingers and toss it all in a bowl with spinach and a dash of your favorite dressing. 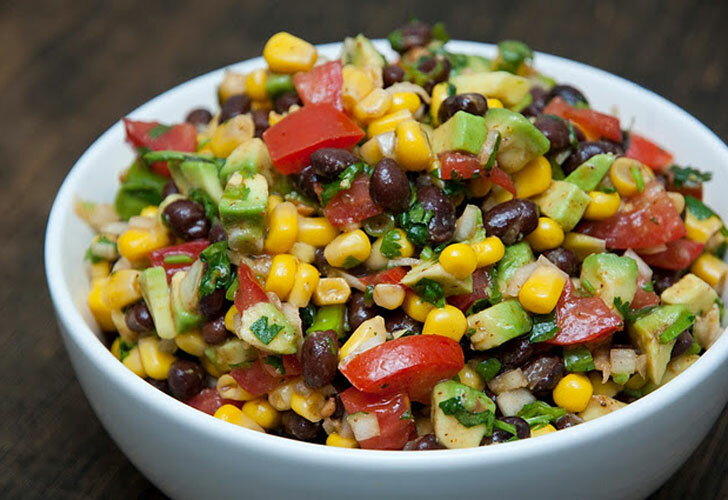 <h2>Southwest Salad</h2> Turn taco night into taco salad night with this easy recipe that's so flavor-filled your kids won't even think about the fact that they're eating a healthy portion of veggies. Toss together black beans, corn, chopped tomato, diced red or white onion (if your kids aren't anti onion) and chopped scallion. Then add the juice of one lime, 2 Tbsp extra virgin olive oil, 1 tbsp chopped cilantro and a few pinches of salt, pepper and chili powder. Marinate in the refrigerator for 30 minutes. Then add the chopped avocado and enjoy. Want more veggies? Dice and mix in green, red, yellow and/or orange peppers as well. Serve with taco chips (who says you need a fork to eat a salad!) or in a more traditional salad-style over a bed of romaine lettuce with a bit of ranch dressing. Find the full <a href="http://snacktheplanet.blogspot.com/2010/06/southwestern-black-bean-salad.html">recipe on Snack the Planet</a>. <h2>Napa Cabbage, Asian Pear &amp; Carrot Salad</h2> Does your kid turn her nose up at cabbage or complain about eating carrots? This Asian salad might make her forget her finicky ways. The recipe gets just the right amount of sweetness from an Asian pear, which adds additional crunch at the same. 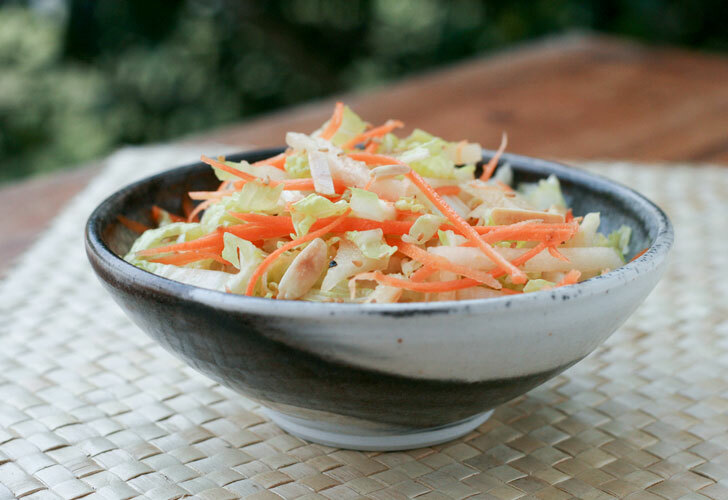 Combine 4 to 5 cups of sliced Napa cabbage, 2 peeled and julienned carrots, 1 sliced Asian pear and a handful of toasted sliced almonds. Next, mix up a special dressing using 3 Tbsp vegetable oil, 2 Tbsp rice vinger, 1 tsp soy sauce, 1 tsp sesame oil, 2 tsp sugar and a dash of salt and pepper. Garnish with sesame seeds. Want to make it the main event? Toss in grilled chicken or <a href="http://www.inhabitots.com/make-easy-exotic-vegan-tofu-lettuce-wraps-for-chinese-new-year/img_4777/">Asian spiced tofu</a>. Get the full recipe from <a href="http://foodlibrarian.blogspot.com/">The Food Librarian</a> on <a href="http://www.kitchencorners.com/2012/01/napa-cabbage-asian-pear-and-carrot.html">Kitchen Corners</a>. <h2>Hazelnut Cherry Salad</h2> If you've never added cherries to a salad, here's your chance to try it! 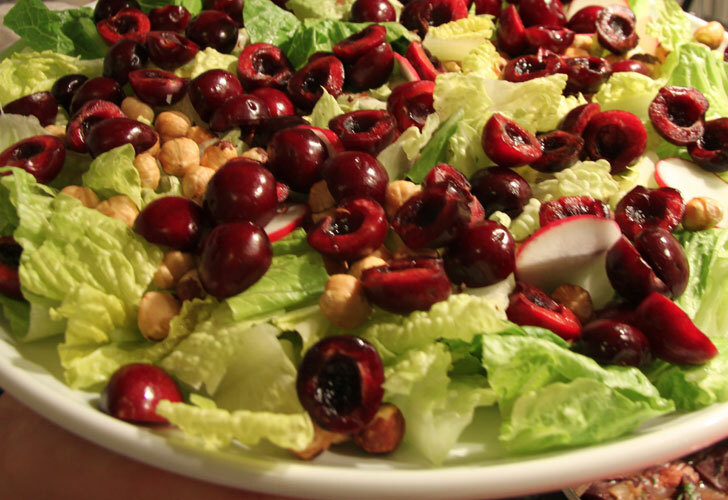 This salad mixes sweet cherries with crunchy hazelnuts, radishes and romaine lettuce. A number of dressings would taste delicious on this combo, so let your child choose a favorite from ranch to a fruity vinaigrette. <h2>Rainbow Salad</h2> To truly make salad artistry a fun event, challenge your kids to create a <a href="http://www.inhabitots.com/inhabitots-greenmarket-recipes-for-kids-rainbow-salad-by-sarah-poten/">rainbow salad</a>. Depending on the season, visit your local farmers' market or grocery store and ask your kids to find at least one fruit or vegetable to match each color of the rainbow - red, orange, yellow, green, blue, pink and purple. Not only will this concept encourage your children to try new veggies, we know that a colorful plate means you're getting a healthy variety of nutrients. While the ingredients of this salad can vary, options include: red pepper, red tomatoes, carrots, orange heirloom tomatoes, fresh corn, lemon cucumbers, lettuce, baby greens, cucumbers, green zebra tomato, blackberries, concord grapes, purple carrots, freshly grated purple cabbage, radishes and a pink chiogga beet.